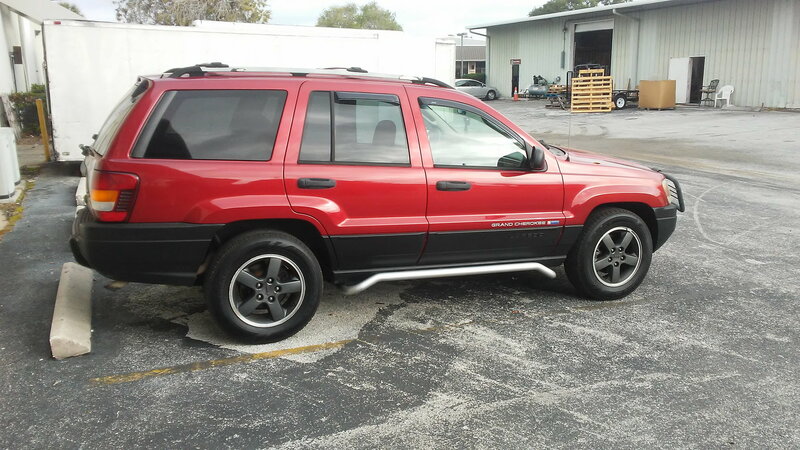 I know this has been asked before but i have a 2004 GC SE and i have the opportunity to pick up a set of 17 inch rims off of a 2004 GC Freedom Edition...will i have any problem with the tires rubbing with my stock suspension? I don't believe so because they use a lower profile tire. I don't think so either my 04 "Overland" came with P235/65R17 on it stock. Okay, you see? I have 70s on my 16s, Fred has 65s on his 17s. Yup it doesn't matter what factory Jeep rims you put on a WJ... you just have to have a 5x5 bolt pattern. Wrangler/Wrangler Unlimited JK ('07-'17), Grand Cherokee WK and Commander XK ('05-'10) and Grand Cherokee WK2 ('11-Present) rims will all fit fine onto any '99-'04 Grand Cherokee WJ. I'm running a set of '07 Wrangler/Wrangler Unlimited JK 16"x7" rims on my '02 Grand Cherokee WJ right now and they fit fine. The only thing you'd have to worry about when it comes to swapping out the rims is if you put big tires on your Jeep as well. She wuld like to upgrade from the 16" to a 17"
is there a particular offset required? what the biggest tire in a 17 that will fit under a stock GC? Depends on what she wants to do. Read the above posts. If it's left stock you can use the 17's but use a lower profile tire. I have a 2.5 inch lift, 16X8 rims, 4.25 back spacing with 32" tires and I still rub sometimes. Last edited by GUARDIAN; 12-25-2016 at 05:23 PM. Mine has 235/65R17s on it. she has some cool aluminum rims already, but I think she wants a black or dark color rim with a more rough off road style! I think if the lower body molding had the dark tint on it it would look just fine... I myself am not a chrome fan but different strokes for different folks.... If you need photos or measurements from me let me know, I am happy to help in any way I can sir!